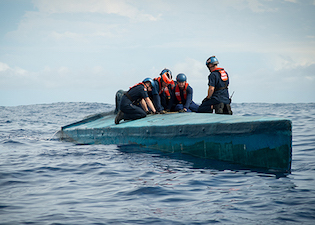 Some 560 tons of cocaine were seized in the eastern Pacific and Caribbean since 2016 and the massive haul represents a fraction of the illicit drug smuggled into the United States, according to the head of a Southern Command anti-drug task force. 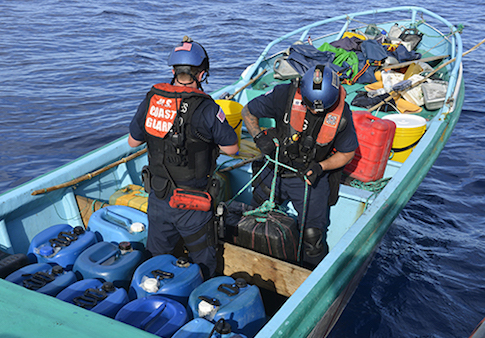 "That was just a drop in the bucket of what we were able to detect," said Coast Guard Rear Adm. Christopher Tomney, director of Southcom's Joint Interagency Task Force-South, a multi-agency, international counter drug unit based in Key West, Fla. The drug flow has increased in recent years due to a jump in production in South America, mainly from Colombia and Ecuador, two main supply states. "We're still dealing with a growing flow," Tomney told reporters recently. "Interdiction is not going to solve this problem. So there are massive quantities of drugs still reaching America's shores to satisfy the appetite of the users in the United States." The anti-drug task force includes law enforcement and intelligence personnel and assets, and despite the massive drug flow has improved its counter-drug programs in recent years with better sensors and closer international cooperation with South American and Central American authorities. The task force was first formed in the 1980s during the Reagan administration when drug smuggling was identified as a national security threat. "Our shortage is not for a lack of information, or a lack of awareness of what's going on," Tomney said. "Our shortage is a lack of operational capabilities to respond to that." Increased coca cultivation in South America has produced a "tsunami of cocaine" entering the country by various means, including container ships, fishing boats, special drug-running fast boats, aircraft, and recently covert, semisubmersible vessels. In a briefing for reporters at Southcom headquarters in Miami, Tomney disclosed statistics revealing a staggering amount of cocaine and other illicit drugs continues to move from South America into the United States largely unimpeded, except for the interdictions by ships and aircraft operating for what is called JIATF-South. For example, for fiscal year 2016, between October 2015 and the end of September 2016, the task force detected 4,700 "events"—possible drug transits, mostly on the water, in the region. Among the suspected trafficking events, 25 percent were targeted for diverting a ship or aircraft, but only 39 percent of those targeted were actually located. The limits on locating targets is due to the task force's large operating area of around 42 million square miles of water in the Pacific and Caribbean. Of the 39 percent, a total of 72 percent resulted in the disruption or interdiction operation and seizure of drugs or other contraband. 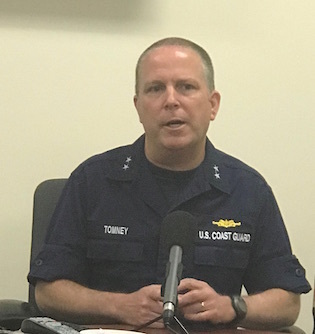 Tomney said of the 4,700 events, only around 350 resulted in interdictions of mostly cocaine shipments, or roughly nearly one interdiction per day. The large seizures of cocaine since 2016 are likely the result of improved international partnerships. Tomney said French and Dutch military commanders are part of his task force and other militaries also cooperate. "Despite international politics, this is a problem set that most nations of the world can rally around, can find common ground," he said. The task force will continue its interdiction work but the admiral said more needs to be done to reduce drug user demand. He also said cultivation of coca in South America should be curbed through crop substitution programs. "But we're basically a consumer nation so until we can solve how much we consume, there's always going to be a market to traffic in this kind of commodity," he said. Tomney said cocaine remains the main problem in the Southcom region and not opioids. "Specifically on opioids, we're not doing a lot down here, and it's not because we're not interested or it's not our mission space," he said. "We are focusing efforts against all illicit trafficking. Most of the opioids do not transit through this region. They come through the international postal service; they're coming from China, they're getting mailed in." Instead, cocaine is the main drug headed north, along with special interest aliens, as shipments of guns and bulk cash, derived from drug profits, flow southward through the region. Asked if there are newer threats from drug smugglers, Tomney said: "I don't know if we have a newer threat. If there's a new threat, it's just the volume that we are seeing." Drug trafficking networks are increasing production and have begun shipping large loads of drugs, anticipating that if a quarter of each shipment is seized, three-quarters will pass through. The traffickers also have shown little inclination to hide the drugs being smuggled. Monitoring aircraft have seen cocaine bales packed openly on fast boats. "If I were to describe their strategy, they're flooding the end zone," Tomney said. "They put so much out, and know that we only have so many assets that we're not going to be able to interdict it all." The task force conducts what are called "pulse operations" throughout South America. For example, a major drug network was taken down in Guatemala with the help of local authorities. The traffickers then adapted by increasing drug transits from South America directly into Mexico, bypassing the closed network in Central America. Tomney said 80 percent of the known cocaine traffic flows along the eastern Pacific and 20 percent transits the Caribbean. "That's about what we know. We obviously don't know what we don't know," he said. Most of the drug shipments are transported in open fast boats called panga that are built in South America specifically for transporting drugs. The boats are an open wooden hull with multiple outboard motors and filled with drugs and fuel. Other methods include the use of fishing boats, sailboats, containers on merchant ships, and what are called self-propelled semisubmersibles. "There's no method that they haven't tried," Tomney said. "They use non-commercial aircraft, so in addition to monitoring the maritime domains, we're also working with our international partners monitoring the air domain looking for illicit flights as well." The use of submersible craft increased since 2016 when six were detected during a nine-month period. The submersibles often are fashioned from a sailboat with all deck structures removed. The deck is then coated with fiberglass to seal it from water and outfitted with diesel engines. When filled with drugs, the submersibles sink in the water so that only a small portion of the deck is visible, making them difficult to spot. Monitoring aircraft have been able to track the subs by looking for their wakes. "So it's very hard to see visually," Tomney said. "There's not much freeboard, so there's not much for a radar to pick up as well." The submersibles are self-contained and carry enough fuel to travel nonstop from South America to Central America. One submersible can carry up to 8,500 kilograms of cocaine, and the vessels were recently outlawed because smugglers outfitted them with scuttling valves that were used to sink them if caught. Without the drugs contained in the vessels, authorities could not bring prosecutions. A recent law outlawed the use of submersibles since they have no legitimate purpose. "So if you can put 8,500 keys of cocaine in there, you could put 8,500 pounds of anything that you wanted to move without being detected, whether that's 8,500 keys of explosives, move terrorists, move special interest aliens, whatever because they are very hard to detect," Tomney said. "Nearly a week doesn't go by where we don't have intelligence that the networks are using [these]. And they're pervasive. This technology is not unique just to the eastern. Over the years we've detected them in the Caribbean; we've seen them in the Atlantic Ocean. So it's not really very complex technology. Just take a sailboat hull, fiberglass over it put an engine it." Tomney said the task force has focused on disrupting the drug flow as close to the suppliers as possible, a stage when shipments are the largest and before they are broken down into smaller and smaller loads. "We have basically multi-ton loads of cocaine, and once it gets into Central America, it starts getting broken down into smaller sizes until you get that retail size," he said. Cooperation with the Air Force also has helped the task force, Tomney said. Air Force training flights are being used to spot drug smugglers. "It doesn't cost any more money but they fly in this theater, and we're a target rich environment," Tomney said. "They're flying after real world targets so their air crews get real world training. We benefit by getting additional eyes and sensors in the sky to help us do our mission and that's been a great success." This entry was posted in National Security and tagged Drugs. Bookmark the permalink.